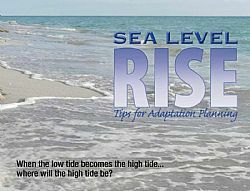 Sarasota, FL – Sarasota Bay Estuary Program (SBEP) recently launched the Sea Level Rise (SLR) brochure. The purpose of the publication is to provide the public, community leaders and elected officials tips for adaptation planning. The focus is on adaptation for the impacts of sea level rise so that critical human systems and natural systems can continue to function effectively. The focus is on adaptation for the impacts of sea level rise so that critical human systems (such as communities, economies, and culture) and natural systems (including wetlands, coastal ecosystems and ﬁsheries) can continue to function effectively and be resilient in the face of climate change. The tools and tips offered in this brochure are also broadly applicable to many other climate-related impacts, such as more temperature extremes, heat waves and heavy precipitation periods, increased drought in some areas, and more extreme weather events.